Tektronix is launching a rackmount version of its MSO 5 Series Mixed Signal Oscilloscopes. 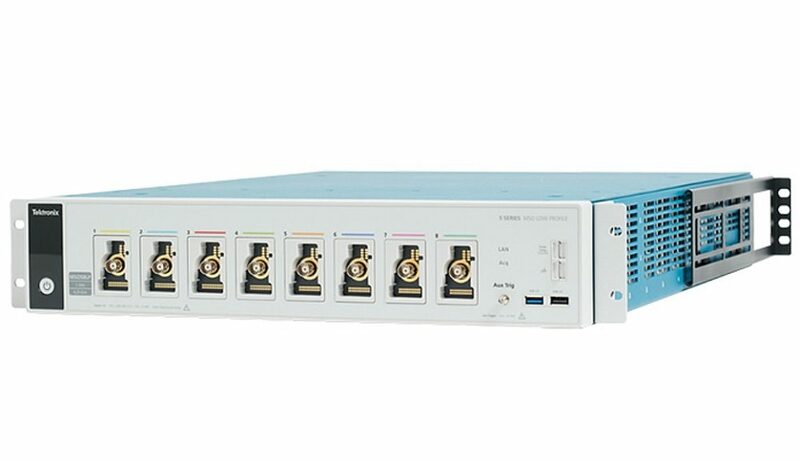 The modular version of the MSO 5 Series offers 1 GHz analogue bandwidth, 6.25 GS/S sampling rate on all channels and 125M recording length. This compact oscilloscope is designed for machine diagnostic applications and automatic test electronic systems (ATE). Rack-mounted oscilloscopes, which are generally remote-controlled, are, according to Tektronix, commonly used to evaluate the performance of various equipment in the field of high energy physics (pulsed energy), Defence and materials research. As with electronic automatic testing applications, compromises are often required to implement appropriate solutions in terms of cost, performance and number of data acquisition channels, while coping with space constraints. The MSO 5 Serie’s FlexChannel technology, which combines 8 analog channels or up to 64 digital channels in the same oscilloscope, stands out in the market. While their 12-bit resolution analog-to-digital converters provide more accurate data and thus provide information that allows for significant advances in some areas of research,”said Brian Ice, Tektronix’s General Manager of Consumer Oscilloscopes. These oscilloscopes are equipped with 12-bit resolution analog-to-digital converters with 7.6-bit effective number of bits (ENOB). These 12-bit CANs provide vertical resolution 16 times to their 8-bit counterparts. Traditional benchtop oscilloscopes occupy a 6U space in a rack for 4 input channels. The modular version of the MSO 5 Series offers up to six times more channel density by combining its 8 FlexChannel inputs in a 2U package. The price per channel is, according to Tektronix, less than $5000 per channel (about €4200). Thanks to this rack-mountable version without HMI, it is possible to use the 15.6-inch MSO 5 Serie benchtop oscilloscopes with 15.6-inch touch screen during product development and then use the compact version for production testing. The same software and test routines can be used in R&D and during production testing. The MSO 5 Series oscilloscope modules are now available for order. The first deliveries are scheduled for the first quarter of 2018. Their price starts from US$39,900 (about €33 700).